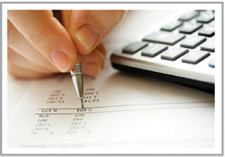 Accounting procedures and business related Government requirements. Our services allow clients to focus on running their business. Less expensive than paying a full-time employee. We track deadlines for Government remittances and payables and complete such forms as T4′s and ROE’s. Available daily, weekly or monthly, based on your requirements. We also offer customized reports based on your needs. We will help you set up and/or organize all your files and records.